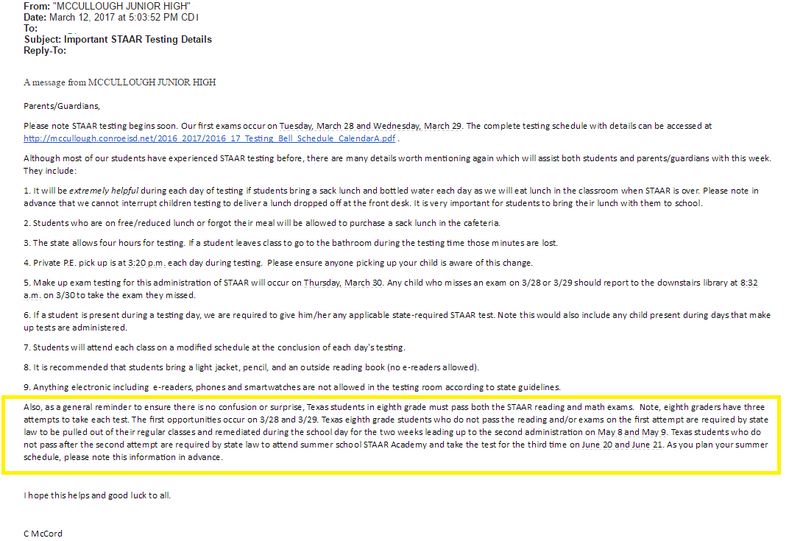 Texas students in eighth grade must pass both the STAAR reading and math exams. This is false because the Texas Education Code provides that students who do not pass the STAAR math or reading in 5th or 8th grade can be promoted by a Grade Placement Committee. If we look to 2015 (the last time STAAR based retention was on the table), Conroe had a 6% 8th grade English failure rate, but only a 0.6% retention rate. Clearly, 90% of the students who failed STAAR were not retained. They were promoted via GPC just as the statute envisions. Yet, the junior high does not see fit to tell parents that. They only spread the false narrative that 8th grade is a “must pass” year. Texas students who do not pass after the second attempt are required by state law to attend summer school STAAR Academy and take the test for the third time on June 20 and June 21. The school worked really hard on this sentence to pack two entirely separate lies into one long sentence. First, there is absolutely no state law or rule that requires students who have not passed STAAR after two attempts to attend summer school. Moreover, this isn’t even entirely a local decision. The law, again, requires “accelerated instruction” without requiring any particular duration, content, form, method or location. But that is not a decision that can be made now. The accelerated instruction for each individual student is determined by the Grade Placement Committee, of which the parent is a member. Any school telling you what the decision of that committee will be before it even meets is essentially saying they have no intention of following the specific requirements of Texas law. If the decision is not made by the GPC, it is not valid and can be ignored. Second, state law does not require any student to take the third administration of STAAR. In fact, it explicitly permits a parent to waive the third administration. It is the one circumstance most schools will acknowledge an opt out right. But apparently not in Conroe – they choose to lie, deceive and bully. Let me try giving this e-mail a re-write for the hapless administration of this poor school.